Three New Releases, a New Stormy Night Author, and a Fantastic Sale! We have three new releases for you this week, including a superbly steamy bad boy shifter romance from Renee Rose, a blazing hot new sci-fi title from Ava Sinclair, and an excellent first book from new Stormy Night author Ashlynn Ally. 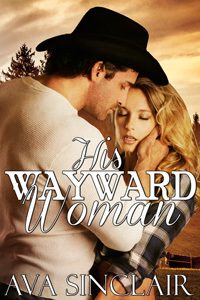 The next section of His Wayward Woman can also be found below. Finally, for the next few days Grace Goodwin's bestseller Claimed by Her Mates is on sale for only $0.99. Click here to take advantage of this great price! Fresh out of the foster care system and on her own for the first time, eighteen-year-old Jaden Macklemore plays by her own rules, but when she is caught stealing a wallet her life is suddenly turned upside down. Instead of calling the cops on her, the stern, handsome man who thwarted her attempted theft offers her a place to stay and a chance to start a new life, but there will be conditions. As long as she is under his roof, Jaden will be expected to follow his rules, and failure to do so will earn her a sound spanking on her bare bottom. Since he is familiar with the foster system himself, Justin Owens understands what Jaden has gone through, but he also knows that if she is going to get back on the right track it will require strict rules which are enforced consistently. He quickly makes it clear to his beautiful, defiant new ward that from now on, smoking, swearing, and stealing will all result in painful, embarrassing punishments that will leave her a very sore, very sorry young lady. Though at first Jaden is shocked and dismayed to be treated in such a childish and humiliating way, soon enough she finds herself appreciating Justin’s guidance and even, grudgingly, his firm-handed discipline. Yet while she feels safer in his care than she ever has before, she can’t help wondering if he might one day see her as more than just a little girl in need of his help or if he will eventually cast her aside the way so many others have before. Can Justin win her trust and claim her properly before her fears tear apart everything they have built together? Publisher’s Note: Jaden’s Chance includes spankings, sexual scenes, and elements of age play. If such material offends you, please don’t buy this book. After one loser boyfriend too many, Melissa Bell swore she was done with bad boys, but when her ex puts her life in danger it is a buff, tattooed, dirty-talking alpha shifter who shows up to save her. More disturbing still, her rescuer makes it clear that he regards Melissa’s safety as his personal responsibly, and defying his instructions soon earns her a painful, embarrassing spanking. Though the punishment is humiliating enough on its own, however, it is her body’s reaction to the tough, handsome wolf’s stern dominance that truly leaves her blushing. It doesn’t take long for Cody to find himself wishing he’d never made an alpha’s promise to protect Melissa, yet for some reason he can barely control himself around her. His inner wolf craves the beautiful human in spite of her snobbish attitude and constant sass, and when she is writhing over his knee with her bright red, well-spanked bare bottom on display it is all he can do not to mark her and mate her right then and there. Publisher’s Note: The Alpha's Promise is a stand-alone book set in the same world as The Alpha's Hunger. It includes spankings and sexual scenes. If such material offends you, please don’t buy this book. When investigative journalist Emily Klein gets too close to the truth about a devious plan by corrupt government authorities to remove undesirable humans from Earth and imprison them in penal colonies on the planet TraoX39, her meddling ends up landing her in the same alien prison system she sought to expose. Zak Steth has been adrift since disobeying orders to save the life of a friend got him branded a renegade and dismissed from the Galactic Legion, but when his latest job as a bounty hunter lands him face to face with a beautiful, feisty human female, he decides to take her as his own. But taming Emily won’t be easy. She is willful, defiant, and in desperate need of a firm hand, and Zak will have to keep her safe in a world which is completely unfamiliar to her. He wastes no time in starting his new mate’s training, spanking her bare bottom soundly whenever she disobeys and teaching her that her body is now his to enjoy in any way he pleases. Despite her deep shame at being utterly dominated and punished as often as Zak feels it necessary—sometimes in ways far more humiliating than a mere spanking—when the huge, handsome warrior claims her hard and thoroughly the pleasure is beyond anything Emily could have ever imagined. But with both humans and aliens still hunting them, can they outwit their enemies and escape TraoX39 before it is too late? Publisher’s Note: The Warrior’s Prize is a stand-alone book set in the same world as The Alien’s Captive and Bride of the Trogarians. It includes spankings and sexual scenes. If such material offends you, please don’t buy this book. Ivy Barrett's first book with Stormy Night, Their Defiant Human, has reached the Top 100 in Amazon's Science Fiction Romance category! Congratulations Ivy! Claimed by Her Mates Captures a #1 Spot! Grace Goodwin's best-selling book Claimed by Her Mates is currently on sale for $0.99, and it has stormed into the #1 spot in Amazon's Science Fiction Romance category! Congratulations, Grace!